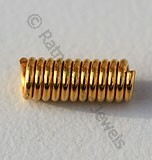 If you desire the effects of your jewelry to be dramatic, subtle, bold, glamorous, monochromatic, regal and natural then buy ‘Gold Spacer Beads’ for yourself. Maybe you have been constantly searching for the kind of beads that catch the eyes of every single person, yet by no means actually could you find anything that fits your imagination and suits you. 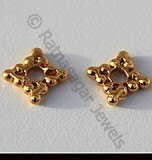 One thing that is sure to win several hearts is gold spacer beads and the best kind of these are available at the online store of Ratna Sagar Jewels. The designers of these beads are trained and have an experience of twenty years. Mixing the traditional and modern techniques has brought some of the best results in beads. 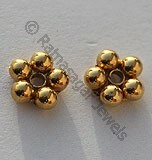 While the gold that is used to create them coordinated beautifully with the designs. 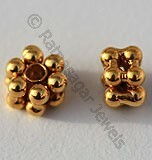 These jewelry that is made with these gold spacer beads is a sure shot extension towards you accessory collection. When searching for the best beads in the market the right place to be at is Ratna Sagar Jewels with a surprisingly beautiful range of gold spacer beads. 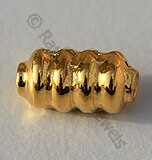 The charm of gold and the exquisite deigns makes these beads and jewelry the best in its kind. Handmade solid genuine 18k Gold Beads and findings for designer gemstone jewelry making are available in 75.6 percent of purity and yellow in color, Small Daisy Spacer Beads. Handmade solid genuine 18k Gold Beads and findings for designer gemstone jewelry making are available in 75.6 percent of purity and yellow in color, Spiral Tube Spacer Beads. Handmade solid genuine 18k Gold Beads and findings for designer gemstone jewelry making are available in 75.6 percent of purity and yellow in color, Flat Diamond Spacer Beads. Handmade solid genuine 18k Gold Beads and findings for designer gemstone jewelry making are available in 75.6 percent of purity and yellow in color, Double Flower Spacer Beads. Handmade solid genuine 18k Gold Beads and findings for designer gemstone jewelry making are available in 75.6 percent of purity and yellow in color, Wire Tube Spacer Spacer Beads.